My program project (patterns give prediction). I am posting on this forum to talk about a project I’ve been working on. I’ll try to be short and concise. I’ve been thinking of a solution to anticipate in the best way possible the movement of the market. 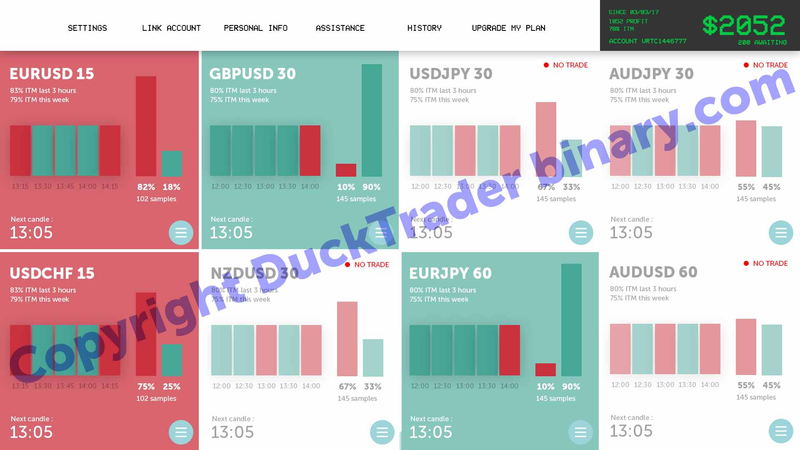 As a lot of you probably have, I have tried several different combinations of indicators, I have tried signals services, I have tried applying some strategies of my own… In the end, my ITM ratio is never satisfying enough to me. I don’t want to be a big trader. My trading strategy is placing maximum 5 big takes a day, take the money and call it a day. I don’t spend my life trading, I am not interested in doing so. With that in mind, I need a simple yet accurate predictive algorithm to help me place 5 trades tops. The solution I have thought of is based on patterns. At each new candle on a timeframe, the algorithm looks a couple candles back (say 4 to 10), saves the pattern, and searches for all the occurrences of this pattern for a period back in time (say a year). It looks up how many times this pattern was followed by a red candle, and a green candle. Then it compiles the statistics. To make it simple to understand, i worked on what the graphic interface of the software could look like. The image is low def and watermarked by me to avoid copying. As you probably guessed the screenshot is just a demo, the numbers are not real, it is just to show what the software could look like. I have a background in coding and I am able to code such a tool, I want to make it great, I am really excited about this. But this requires a lot of work, and I want to make sure people are interested before I start working on it for good. These are the options I can think at the top of my head. Exciting huh? The plus factor of the program+algorithm is the graphic interface, with all the extra options it brings to the table. It is simple and direct to understand, and can be tweaked easily. The software doesn’t exist yet, I just wanted to get any feedback here on this forum to know what you guys think. Anyways, this is a quick preview/draft of the project, waiting for feedback and see who is interested!